The episode opens with a bookie (Danny Aiello!) and his sidekick hanging out in a shabby diner. Danny’s an old-timer, and while no one’s placed a bet with him for quite some time, he still considers himself ‘the best in the business’. 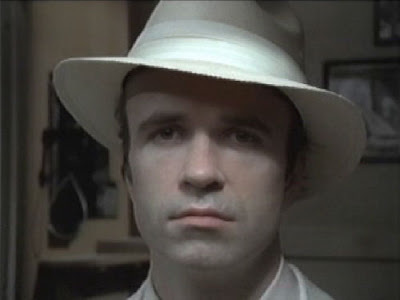 Suddenly there’s a cold draft, and a mysterious stranger in a white suit (Tom Noonan!) enters. After nervously checking a piece of paper, Tom slides five gold coins across the table. He wants to bet it all on a 40-1 shot at Belmont. Danny explains that he’s too late, and the race has already started. Tom’s not worried, and as they switch the radio on, it turns out that the race was delayed, so the bet can go ahead. Naturally, the horse wins, and Danny tells Tom that he can pick up his twenty thousand the next day. Tom explains that he’d rather let it ride on a baseball game, picking the Orioles at 3-1. Danny’s sidekick leans in and reminds him that since the game is that night, he doesn’t have time to lay the bet off. Danny replies that he’s never once refused a bet, so he accepts it. I’ve got to say, at this point in the episode I’m liking that they’re not over-explaining the gambling terms that they’re talking about. Instead of making me feel like they think I’m an idiot by going over everything line-by-line, they’re having the characters speak in a shorthand, trusting that the audience will either know what they’re talking about, or understand the dramatic tropes being employed, so that the stakes will be clear whether the viewers have a specific understanding of the language or not. Later that night, Danny is flooded with calls. It seems that someone has been passing on the Orioles tip, and everyone’s calling in to bet on them. The next day Danny’s in a slump as Tom drops by, ready to pick up his shoebox full of money. Tom’s gloating laughter reminds Danny of someone: “Bill Lacey”, a luckless gambler from way back in the day. Tom must be his son, traumatized by his father’s suicide, and back for revenge, gambling-style! Or is he? Tom wants to bet on an 8-1 underdog in the fights that night. Danny announces that if he wants to make the bet, the odds are only 4-1, and if he tells anyone about the bet, it’ll drop down to 2-1. They finally get into it, with Tom announcing that he blames Danny for Bill’s death, and Danny responding that no one forced Bill to bet more money than he had, or pushed him off the bridge. He was a luckless coward who took the coward’s way out. Tom storms off, furious. Of course, the next day he’s back to pick up his quarter-million dollars, looking to go double or nothing on a really questionable bet: Danny’s life. If Danny dies of natural causes by 8AM the next morning, he gets double, if he doesn’t, Tom gets nothing. Danny’s never refused a bet, so he invites Tom back to spend the night sitting in the diner, so they can see what happens come 8AM. That night Tom returns with a mysterious man in black carrying his briefcase. A clearly mobbed-up gentleman has also appeared, holding the quarter million that Danny has brought to the table. Now it’s just a question of playing… the waiting game. Danny decides to take a nap for the first few hours of the event, and Tom displays the unnerving habit of staring at Danny, without ever blinking. Which, to me, seems like a bit of a cheat – if you woke up to this, wouldn’t you have a heart attack? Finally the clock reaches 7:53, and the real action begins. After pretending to be dead for a moment, Danny laughs it off, and decides it’s time to finally confront Tom. It seems that Danny has known all along that Tom wasn’t anyone’s son – that it’s really the ghost of Bill Lacey he’s been gambling against all this time. It’s Danny’s theory that Bill found out just enough about the future from the other side to know how a few games were going to end, and how and when Danny was going to die. “And then he tried to make it pay.” Danny’s not buying it, though – he thinks that the human will is the most powerful force in the world, and that if he doesn’t give up, he won’t die at 8AM. Just then an alarm rings, and Tom checks the clock. It is, in fact, 8AM, and the bet is over. The mobster heads out with the cash, and Tom leaves, defeated. Danny pulls out his ledger and scribbles down his last will and testament, while laughing about his own cleverness. It seems that Tom fell for the oldest trick in the book: Danny set the clocks ahead five minutes. Danny scribbles out the last of his will, laughing and satisfied that he went out the best, a man that had never been broken or beaten – until a heart attack kills him where he sits. I’ve got to say – this was the first really good episode that I’ve seen. Whether it’s the confident portrayal of an interesting part of the underworld, or the solid performances of the two lead actors, it’s just a well-told little ghost story that doesn’t suffer from the lack of production values, since the story demands to be set entirely within the diner, which functions as the boundries of Danny’s world, that little slice of the city where Danny reigns supreme. Tom Noonan is especially good as the character who goes through an arc in this one – we’re introduced to a creepy guy who never sweats and has all the answers, then watch as he’s gradually revealed to be a pathetic soul who threw away everything of value he ever had on a sick addiciton, then wasted his second chance on a futile attempt at toothless, misdirected revenge. An educational aside – I looked up what ‘laying off’ was, and it turns out that it’s a practice among bookies of, whenever they get bet larger than they can handle, turning around and making their own, opposite bet with a number of other bookies, as a way of ensuring that they don’t lose too much money. So if Tom bets 60K on Baltimore with Danny, then Danny would bet 50K with a series of other bookies on Baltimore as well. If Detroit wins, even though Danny still has to pay the 50K, he’s up 10K because he gets all of Tom’s money, but if Baltimore wins, he’s only down 10K because he gets paid off by the other bookies. It’s a pretty elegant system, actually.